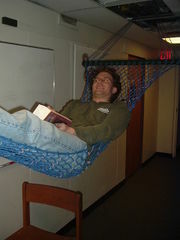 Eric McNeill hanging in a hand-woven Ethernet cable hammock. What else would you do with fifty short pieces of Ethernet cable? The hammock was woven using a chainlink fence pattern (alternating pairs are twisted) in the Goodale stairwell. Two pieces of Unistrut were used for the ends and more ethernet cable was used for hanging. It was hung in Bemis for a day and is currently installed in Walker Chan's room.